About two and a half years ago, I adopted a big blue talkative cat named Mr. Blue (aka Barabajagal). Below the jump is the email I sent out to my cat-friendliest friends announcing his arrival. I didn’t have a blog in those days, but I wanted to post it here to document it, and provide some backstory on the friend I’ve just lost. And for reference in my next post, which will be a kind of elegy for Mr. Blue, who died last week at less than four years of age. If you’re on the home page, click the “Read the rest” link below to keep reading. I have some pleasant news to share … you may not have known I was pregnant, but it turns out I’m having kittens! Most of you reading this know that last June I lost my feline companion of 14 years, Dragon Lady. I still miss her terribly, but after nearly a year of cat widowhood, it appears I am ready to shed the weeds and be adopted by a new cat or two. For months I had been planning to get a pair of kittens “when I’m ready.” I was going to wait a couple months longer before raising the “available cat home” flag … save up for some fancy cat furniture and so forth. But one day in early May, I woke up after a night full of cat dreams. Dragon Lady has regularly visited me in my dreams over the last year, but on this particular day it felt like I had been dreaming about cats literally all freaking night long. So perhaps I was in a particularly … receptive state of mind when I walked into the employee break room at the catalog factory where I’m currently freelancing and saw a flyer with a picture of a beautiful 10-month-old BLUE kitten who needed a home, right away. Before I had time to say “litter pan vacation is over,” I was on the phone with the nice lady in DeKalb who had rescued him from the GIANT CAT-EATING RACOON who chased him into her arms. 24 hours later it was a done deal. He is acrobatic and a bit of a clown. He prefers windowsills to blankets. He is very talkative and he says “Rrrrrr, rrrr, rrrr!” when he is excited, and sometimes he chirps like a bird. He is gorgeous and blue and HUGE. (More than 10 lbs. already â€” I wouldn’t know he was still a kitten and not full-grown if a vet hadn’t said so.) He is very,very good at the circular kitty Gnip-Gnop thing â€” he can sit and play feline ping-pong with me for fifteen or twenty minutes at a time. 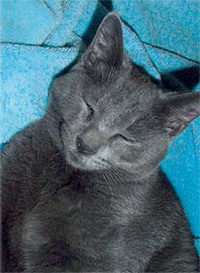 He is blue but not a “Russian Blue,” which according to a Google search requires special papers and a 14-generation lineage and “bottle-green” eyes and mauve footpads. His eyes are probably more yellow than green, his footpads are blue like the rest of him, and his only papers are nestled underneath his litter pan. I prefer a good-natured proletarian to a sniffy aristocat anyway. I am still looking for a companion for him. My original plan was to adopt a pair of siblings from a litter … that’s out the window, obviously. 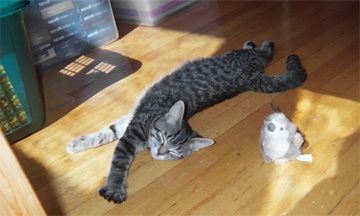 I am now looking for a small, easy-going female kitten to introduce him to. He’s gentle enough that I think he’ll bond well with a kitten, and as long as she isn’t old enough to be territorial or set in her ways I think it will work out fine. I have calls and emails out to various shelters and Cat People I know who are helping me search. Love is hot, love is hot, truth is molten! Goo goo, goo goo Barabajagal was his name now! Eventually he’ll get his own Web page with photos, but for now, I’m attaching the picture I saw in the break room that day. Second-level means you own the greatest hits album and you know “Hurdy-Gurdy Man” too. Third-level means you own actual Donovan albums like Barabajagal or A Gift from a Flower to a Garden. Fourth-level means you live in a house made entirely from tulip petals, speak the ancient tongue of Atlantis, and float three feet above the ground. End of email, back in the present. As a sequel to that, when I adopted Kiwi from the Tree House shelter just a few months later in August of 2005, I sent out a similar email announcing his arrival. I have a kitty named Kiwi Kitten also. He is a rescued siamese!